Give learners a close-up view of a specific area of your slide by adding a zoom region. It's a great way to draw attention to important content. For example, suppose your slide has an image of a machine control panel, and you want to emphasize a critical switch on the panel when the narrator describes it. Or, maybe your slide contains a video of a software demo, and you want to zero in on a particular field at a certain time. 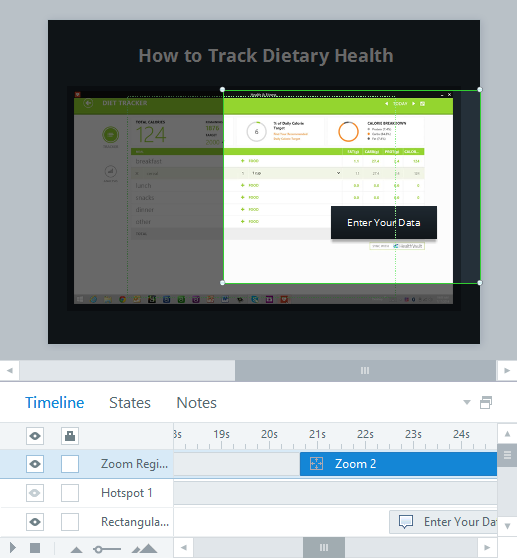 You can have as many zoom regions on a slide as you want. You can even use consecutive zoom regions to create a panning effect. Zoom regions will always have the same aspect ratio as your slides to prevent content from skewing or stretching. Articulate Storyline adds a rectangle to your slide to represent the zoom region. Everything outside the zoom region dims temporarily to indicate you're in zoom edit mode. You can adjust the timing and duration of a zoom region like any other object on your slide. It'll always appear as the topmost item on the timeline. To change the timing of a zoom region, just drag it left or right along the timeline. To change its duration, drag its left or right boundary (to shorten or lengthen it). Zoom regions default to a speed of "medium," but you can change that. You can even make them instantaneous. 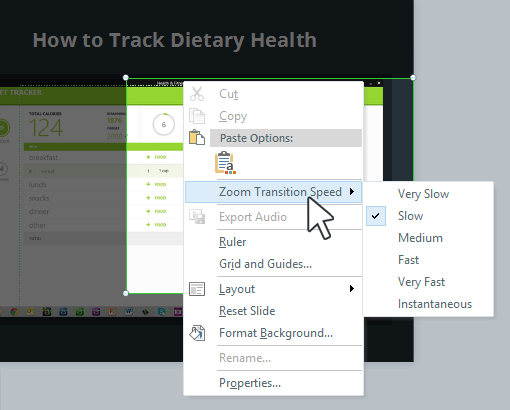 To change the zoom speed, right-click the zoom area on your slide, scroll to Zoom Transition Speed, then choose a speed.